Azurite, the stone of heaven, is so named because it aids us in the pursuit of our ‘heavenly self’. Lightworkers, energy healers and spiritual healers use this healing crystal to help open themselves up as a hollow bone, thereby being better able to channel precise psychic messages and facilitate more thorough energy clearings and healings. Azurite’s meaning has a very important role to play in the metaphysical world. Where some of us lost our way (hey, that left turn at Albuquerque remains tricky even for a spirit like Rabbit), others dance with the blue ray heading toward violet using sacred stones like Azurite as part of their spiritual quest. Azurite’s message is simple and sublime: We are stardust; we are spiritual beings having a human experience. When working intimately with Azurite you may find that your senses jump to unexpected levels of awareness, including potentially contacting Devas, Angels, ETs… anyone who happens to be listening to your proverbial “channel.” Azurite helps keep static clear – keep your eyes and ears open and expect the unexpected. You will never be bored when working with this healing stone, particularly when the Sacred Feminine takes an interest in your activities. If you’ve been wishing for transformation or for your true calling that shift is close at hand. Just be aware that such dramatic forces often come at a cost. Enlightenment isn’t always easy-peasy; if anything it’s a lot of hard work but well worth the rewards. 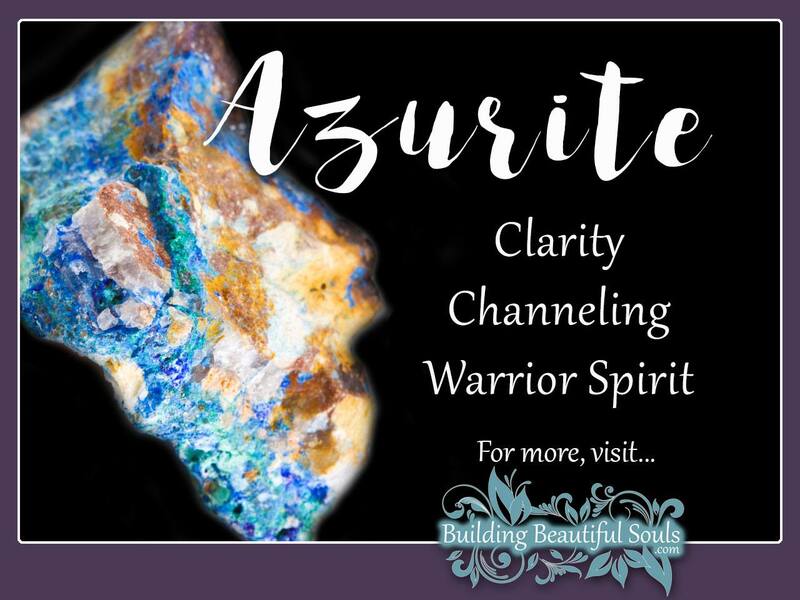 Azurite has an additional association with the Warrior Spirit – someone who leads the charge for change. In this role words of power are incredibly important. Choose and use them with the utmost respect. This stone guides and facilitates effective communication but only with those who understand the multi-levels of meaning to language, both spoken and heard. Here the Azurite challenges you by asking: What is YOUR message to the world? In terms of Chakras Azurite works cooperatively with your third eye. This makes it a psychic stone often utilized by Holy people for greater sensitivity to all the realms including the Dream Time, Channeling spirits and other Shamanic journeying. As a result, you may want to start slowly with Azurite. It can be overwhelming akin to going from zero to 80 on a lazy highway. Have a piece of Azurite close by when doing psychic readings for yourself and others. It acts like a dimmer switch in reverse, amping up the overall sensitivity and accuracy of the information conveyed. For the person receiving this reading, Azurite gives them greater retention powers so that they can tuck those lessons in their pockets and think about them more deeply afterward The gift of memory and perception makes Azurite an excellent metaphysical crystal for people in government, the law and higher teaching. In your spiritual journey you’ll find that Azurite challenges old, outmoded ways of doing things. Pick up a blue crayon and get ready to color outside the box. The Azurite’s energy takes you to new, honest places in your sacred self, reconnecting you to the Divine in all things. As with other magickal stones Metaphysical stores carry Azurite in a variety of shapes and settings, each one of which affects your aura in a unique way. Take some time brushing up on Sacred Geometry and combine that knowledge with your own intuition so you choose the best stone for your goals. Body: Throat problems; Improved energy; Autoimmune support; Hypertension; Central nervous system problems, Skin disorders; Detoxification (and internal organs that play a primary role for same – liver, kidney, etc). Individuals experiencing problems with confusing thoughts can use Azurite for greater clarity (think of Alzheimer’s patients). The energy field it creates brings greater control over random emotions. When your head and heart are not playing nicely together, holding this crystal can bridge that gap and offer assistance from your higher self. Light workers often suggest meditating with Azurite when listening to sacred music. If you feel inspired, get up and dance with it too – shake your booty, get rid of lingering negativity and put Azurite energy into motion – maybe even the Locomotion! Don’t let that unpretentiousness fool you. These crystals have been used for millennia for everything from pigments to ornamental objects and as an aid for communicating with the Spirit world. If you’re feeling “blue” Azurite increases joy and wisdom besides.